Now fully immersed in packing and preparing to leave, we’re casting our thoughts back over the last 3 months and trying to soak in enough of all the things we’ll miss to last us until we return. 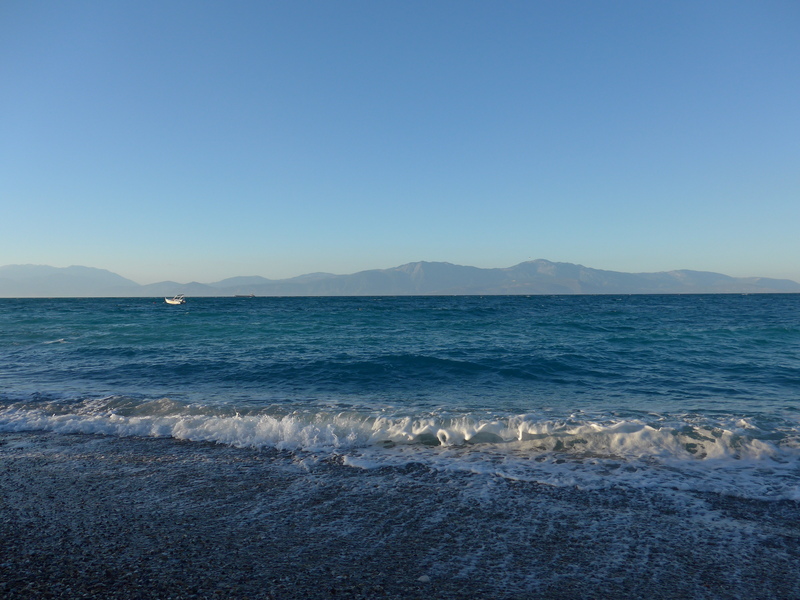 It’s been an unusual season in Greece for us: our earliest-ever arrival and our earliest-ever departure. And, while our neighbors and relatives assure us it was an unusually long and wet winter, it’s not a schedule we’re likely to repeat. Winter here is nothing either of us can complain about but we saw enough to understand what the locals dislike about it. Cool, wet, and windy conditions when you’re longing to be outside is annoying. Leaving the ridiculous weather Washington had this February, we were overjoyed to find the precipitation was liquid rather than frozen. The temperature in the unheated apartment when we arrived was 62. With overnight temps dropping only to the low 40s, we were more than willing to put on jackets to down our morning pot of tea on the balcony. But 4 of the 6 weeks before Easter were wet. 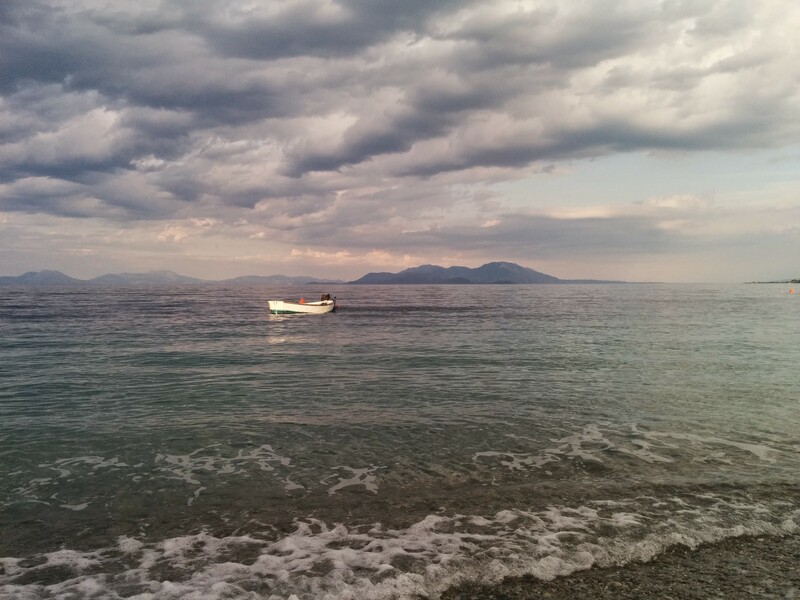 We had to postpone our trip to Mani until the third week just because we wanted to explore it without raincoats. And dining al fresco was problematic because anything hot cooled before even we could wolf it down. In my first post this year, when I said nothing had changed in Sykia, I forgot to make note of the significant tree cutting and replanting work that had been done on the Sykia side of the Pefkias (Pine Forest) that is the pride of the neighborhood. A lot of activity there has helped diversify the forest, reduce fire danger, and improve the health of the established trees. I also neglected to mention work on the Sykia portion of the new highway. The bridge over the stream that runs near our apartment has been finished, and the over/underpass where the new highway crosses the railroad has also been completed, although the approaches to it have yet to be started. We are full of hope for what we might find when we return next year. It’s been a difficult season for the economy, which has slipped back into recession, and has suffered four months of uncertainty about the future. We’ve swung between optimism and despair with the winds of the rumor mill but we are currently hopeful that a long-term agreement will be reached this summer, and that that agreement will put the country on the road to a lasting recovery. 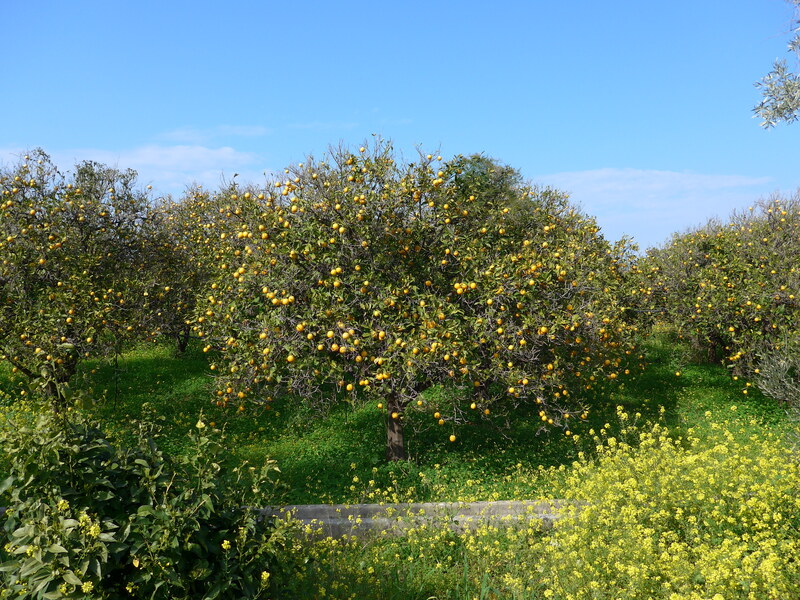 This year we noticed for the first time that orange trees flower while still holding ripe fruit. While great citrus is crazy-abundant here, we also enjoyed excellent strawberries for virtually the entire three months…and they’re not fading yet. We noted the progress of the tomato crop almost from day-to-day, and are savoring near-perfect flavor and aroma right now from a local crop. Korinthia is famous in Greece for its table grapes and raisins and, while we missed the grape harvest, we took full advantage of the raisins; consequently, we are unlikely to ever open another box of Dole’s. We could put up a catalog of small discoveries and big memories from this year’s trip. I particularly remember visiting the astonishing church of a long-gone monastery on the mountain high above Mariolota, and realizing that we could see our breath inside. Outside, the temps were probably in the 60s but the thick stone walls held winter’s freeze tight, and I got a new appreciation for the monks who once rose before dawn to chant and pray in that beautiful ice-box. 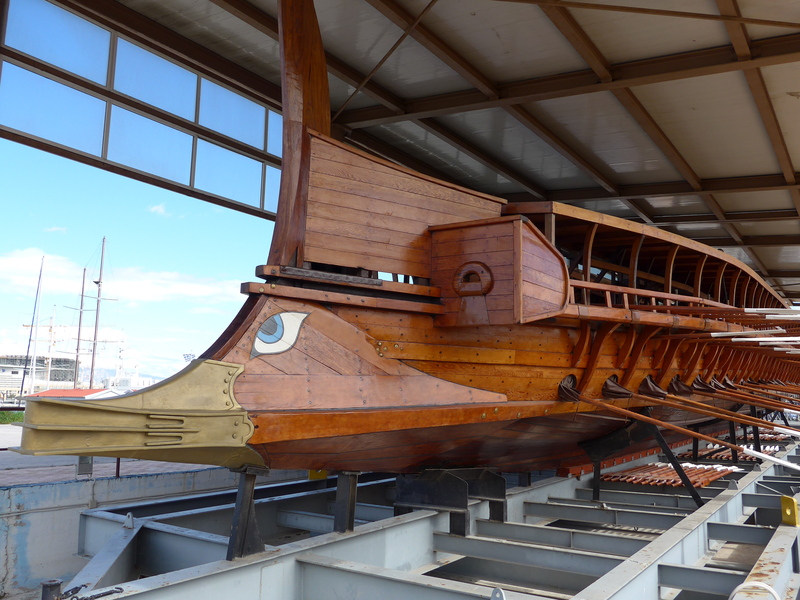 We were also shown the lovely Flisvos Marina near Athens, and then amazed by the maritime museum it contains – imagine a full-scale trireme, with oars extended! After years of noting the loss of one shop after another, this year we took particular pleasure in seeing a host of businesses that, rather than shut down, chose to up their game. New paint, new decor, new tables and chairs, new menus, new spirit, new attitude go a long way to reassuring everyone here that it is possible to make a go of it, even now. The tourists like the fresh look, and the locals like it even more. 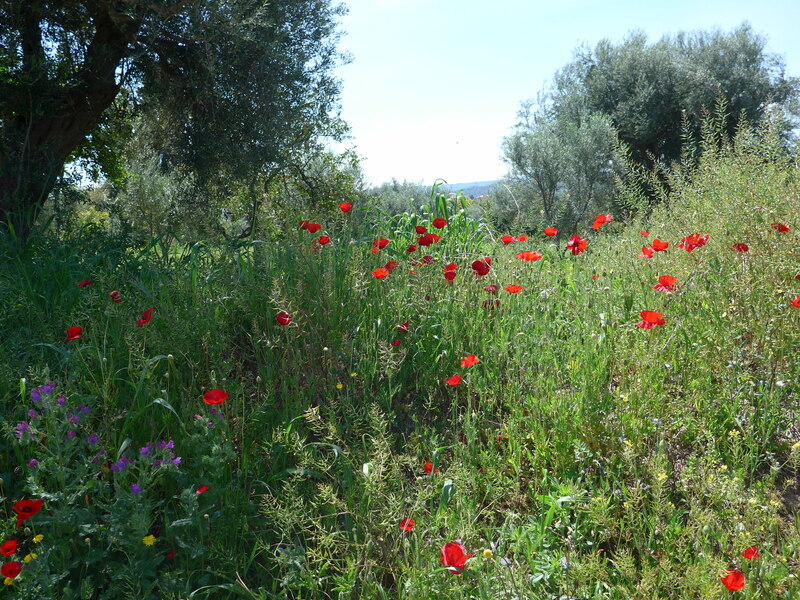 So we leave feeling good about the prospects for our village, and for Greece. We wish our family and friends here a good summer, Kalo Kalokairi, and look forward to seeing them, and the mountains across the water, when we return again to this magical land. 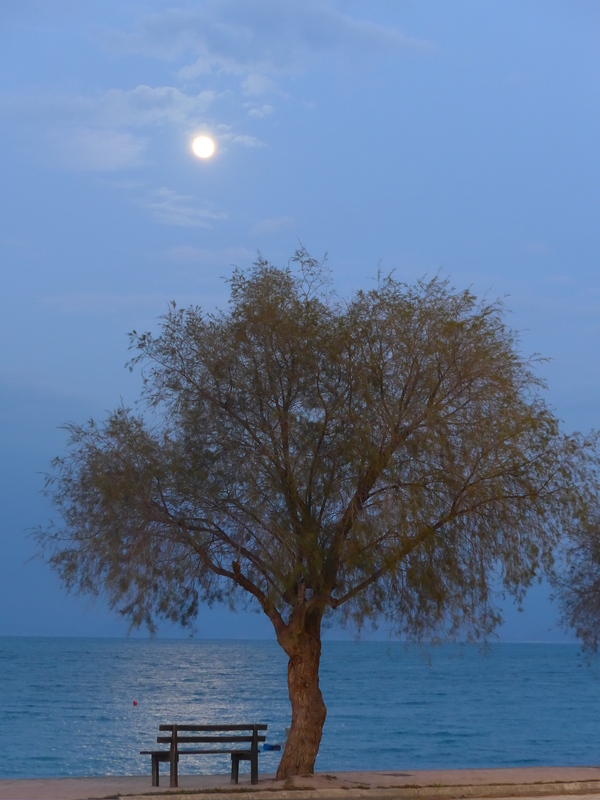 This entry was posted in Dreamscape, Greece, Kolpos Korinthiakos, Peloponnesos, Village Life. Bookmark the permalink. Great post, as usual. You were able to describe this year’s Greek adventure through your photos, experiences, and emotions. As we are set to embark on our journey there, we look forward to once again being able to spending time exploring some new (and famiiar) places, and perhaps even meeting a new cousin or two! Have a great time! The weather is so good I can hardly bear the thought of leaving… In fact, I think I’m feeling a bit jealous of your time here. Take lots of photos, we’re looking forward to the trip report.